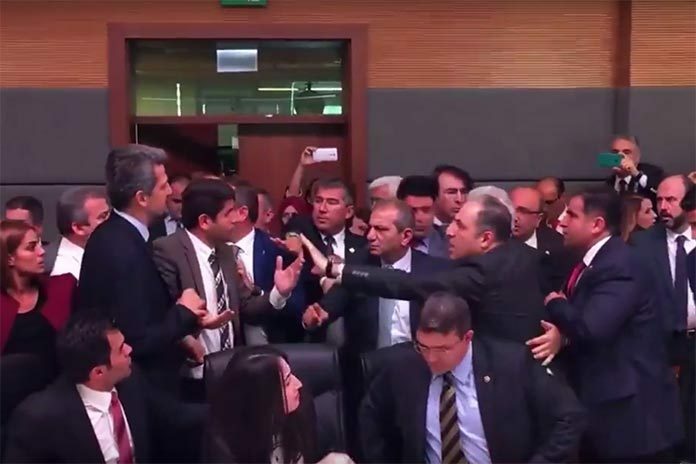 Garo Paylan, a Turkish-Armenian legislator from the Peoples’ Democratic Party (HDP), says he was targeted in a brawl in the Turkish Parliament on Monday for being Armenian. The fight was instigated by members of the ruling Justice and Development Party (AKP) as the parliament’s Constitutional Commission was debating whether to strip pro-Kurdish deputies of their immunity. “It is evident that the members of AKP had targeted me in advance as several of its representatives attacked me in a coordinated manner,” Paylan told bianet.org, adding that the attacks were accompanied with racist epithets, reports Asbarez.com. The Armenian National Committee of America has condemned the attack on Paylan, urging President Barack Obama to also condemn it.